The Sale-A-Bration party just got bigger with our second release. That means more FREE products for you to earn. While supplies last. The biggest Stampin Up sale event of the year! Customers (and Demonstrators) can earn free, exclusive products with every qualifying order. If your wish list is big, don’t miss the demo kit special. It’s the best! 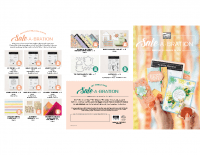 JOIN STAMPIN UP: Get $76 free in your demo kit, anything you’d like (except SAB products but you’ll earn those on your orders after and get a discount – win/win). That alone can value up to Plus free shipping on the kit and future discounts. BEST DEAL!!!!! 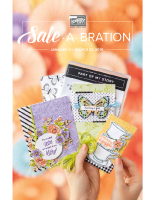 Fill out the form on my Catalogs & Resources page to request your free Sale-abration catalog.